Move significant as Rajasthan is home to coaching hub Kota, which is hit by student suicides. Congress also promises loan waiver to farmers. New Delhi: The Rajasthan Congress has promised to crackdown on private institutions, schools and coaching centres through regulating their fee and infrastructure. 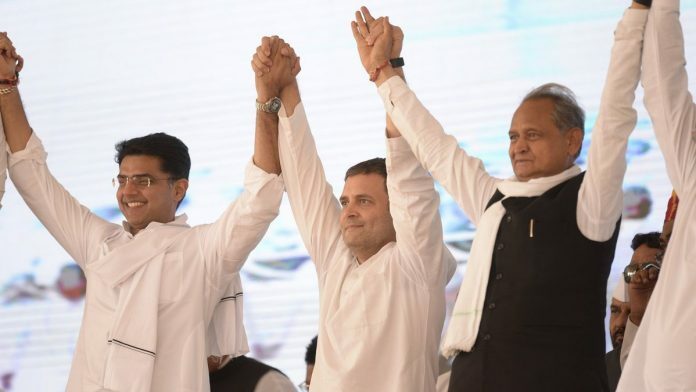 The promise was part of the party’s manifesto released by state unit chief Sachin Pilot and senior leader Ashok Gehlot in Jaipur Thursday. The state goes to polls on 7 December. The manifesto promises to set up a regulatory authority to ensure the changes. “To frame quality mandate for private institutions and coaching centres in the state and to ensure they don’t charge exorbitant fee and create pressure on people to buy essential items such as uniform, books, stationery a regulatory authority will be formed,” it reads. The poll promise is significant as state’s Kota town is a major coaching hub but one grappling with a high number of student suicides. The party has also promised free education for the girl child from primary school till university, right to health among others. The Congress will also revive schemes that it says were shut down by the BJP government. For Hindu voters, the party has proposed the setting up of a Vedic Sanskar and Education board and has promised to promote Sanskrit education and the language in the state. The party has further said that grants of all gaushalas, reduced by the BJP government, will be increased and the cow shelters will be upgraded with adequate facilities. The Congress has also promised strong action against anti-social elements spreading communalism, hatred and religious fanaticism. This comes in the wake of a number of cow-lynching incidents in the state.